This research paper was produced by experts at the Boston Children's Hospital and funded by the Verizon Foundation. BASKING RIDGE, N.J., and BOSTON, June 18, 2013 /3BL Media/ – Technology could be the prescription for improving treatment outcomes, while reducing costs, for children suffering from chronic illnesses such as asthma and diabetes, according to a new report released on Tuesday (June 18) by the Verizon Foundation and Boston Children’s Hospital. 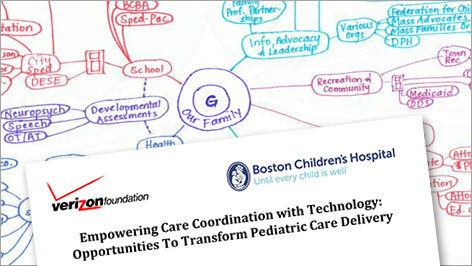 The white paper, “Empowering Pediatric Care Coordination Through Technology,” describes how today’s technology – available, but not fully implemented and integrated with the healthcare systems – can be used to improve the complex coordination of care required for children affected by chronic disease and to help engage parents and children in the care-coordination process to improve health outcomes. The technology includes cloud-based platforms, mobile health applications and provider Web portals. The report also frames the need to develop deeper, technology-driven innovation that incorporates parents and families as key participants in the care of a chronically ill child. According to the National Institutes of Health, more than 32 million children suffer from chronic diseases such as asthma and diabetes. The white paper was written by Dr. Richard Antonelli, medical director of integrated care at Boston Children’s Hospital and assistant professor of pediatrics at Harvard Medical School, and Dr. Andrey Ostrovsky, pediatric resident in the Boston Combined Residency Program. It is available online at http://responsibility.verizon.com/healthcare. The report’s findings are based in large part on a Verizon Foundation event last December that brought together leaders representing families, nonprofit organizations, quality-improvement experts, policymakers, technology leaders, practicing physicians and health delivery system designers. “Healthcare delivery has barely begun to apply communications technology – but the time is now and the means are at hand,” said Antonelli. “The beneficiaries of this innovative work will be children and adolescents with chronic conditions, as well as their families and caregivers. These innovations are broadly applicable and all people, regardless of age, will benefit. “Given that children and adolescents are ‘digital natives,’ I am optimistic about the likelihood of adoption of these communications, care coordination and self-management enhancement technologies,” Antonelli said. · Care coordination – Cloud-based platforms, which would allow all members of the care team – healthcare providers, patients and their families – to share information in a more organized and dependable manner. · Care management – The secure, instantaneous transmission of biometric and lab-specific data to inform clinical decision-making and the appropriate allocation of care would benefit patients and providers, and improve the quality of treatment for chronic diseases. · Education – Web-based portals would enable the entire care team to remain aware of available resources to assist with care coordination, as well as improve compliance with and adherence to treatment programs. · Policy Environment – Proper incentives for technology adoption can drive a shift to a team-based care approach that focuses on the family and patient, rather than the traditional physician-centric model. The white paper’s research aligns with Verizon’s ongoing Powerful Answers Award, which will present $10 million through a series of cash prizes of up to $1 million to innovators and companies whose proposals utilize Verizon’s network, device and platform technologies to deliver social benefits and spur growth in the areas of healthcare, education and sustainability. Initial general concept proposals are due by June 30, and can be submitted at www.powerfulanswersaward.com. Finalists will be selected in following months, and winners will be announced at the 2014 International Consumer Electronics Show in Las Vegas. Rose Stuckey Kirk, president of the Verizon Foundation, said: “Chronic diseases are a critical concern in the U.S., particularly among underserved children who are disproportionately affected by these conditions. Our evolving relationship with Boston Children’s Hospital seeks to find common ground among patients’ families, advocates of care delivery system redesign and healthcare professionals to improve the ability of families to access and take advantage of the daily care and disease management that is crucial to positive health outcomes. Note: The Verizon Foundation provided financial support to produce the white paper. The Verizon Powerful Answers Award is operated by Verizon; Boston Children’s Hospital and Dr. Antonelli have no involvement in its operations, or selection of awardees. The Verizon Foundation is focused on using technology to solve critical social issues in the areas of energy management, education, and healthcare. Since 2000, the Verizon Foundation has invested more than half a billion dollars to improve the communities where Verizon employees work and live. Verizon’s employees are generous with their donations and their time, having logged more than 6.8 million hours of service to make a positive difference in their communities. For more information about Verizon’s philanthropic work, visit www.verizonfoundation.org; or for regular updates, visit the foundation on Facebook (www.facebook.com/verizonfoundation) and Twitter (www.twitter.com/verizongiving).